Yet another mouth watering tangy side dish from green mango. Mavina kayi is a Kannada word used for raw mango or kachche aam. Summer is the only season for mangoes. Lot of dishes can be prepared with fresh raw mangoes. Mangoes can be eaten both raw and ripe. Raw mangoes have a sharp sour taste and is generally green in colour. The raw mangoes have excellent source of Vitamin C, which is beneficial in strengthening immune system and helps in throwing away waste and toxic things from the body. Raw mangoes are also good source of Vitamin B that are beneficial to maintain good health. This may be the reason our ancestors used to prepare this dish in the season and preserve it for the whole year. Yes, it can be preserved for the whole year. You can also substitute it with any other readymade jam. You will be happy to know that it is less time consuming and easy to prepare. I made it easy for you to prepare. Let’s see the preparation of Mavina kayi gulamba. Picking up of good quality raw mangoes is very important. Raw mangoes should be fresh and hard in nature. Wash mangoes with plane water. 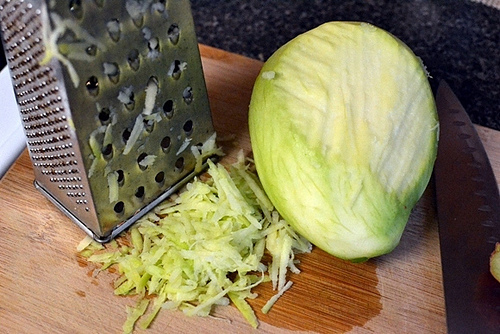 Peel off the skin, grate them and keep it in a bowl. Place a medium size saucepan on medium flame. Pour 1/2 cup of water and grated raw mango to it and toss it with the help of a spoon. Close the pan with lid and cook it for 5 minutes. Open the lid and toss the stuff once again. If it is not cooked completely then allow it to cook for another 2-3 minutes. You might be thinking that how to test whether it is completely cooked or not, right? it is very simple – take a very little quantity of stuff in a spoon and press it with fingers, it will be soft if it is cooked completely. Add sugar, salt and saffron shreds, mix it gently with the help of a spoon and cook it on medium flame untill sugar dissolves in it and syrup becomes little bit thick (it may take 10 – 15 minutes), stir it occasionally. Place small frying pan on medium heat and pour 5- 6 cardamom in to it. Roast them until they start expanding in size and splitting. Allow them to cool for 10 minutes. Make fine powder of them (with skin). If you want you can make cardamom powder in large quantity ( say 50 grams) so that You can use it instantly whenever you prepare sweets. It gives a pleasant aroma to the dish. You need not use any artificial essence available in the market. Add cardamom powder to the dish and stir it and cook it further for 1 or 2 minutes and take out from heat. Allow it to cool down and store it in a clean and airtight bottle. You can serve it with roti, chapati or you can use it as bread spread. Tasty and tangy Mavina kayi Gulamba is ready to serve. Isn’t it simple and easy !